We’re a family-run farm, so we know firsthand how busy mornings can be. That’s why we like to keep our breakfasts simple. With a few different recipes using wholesome ingredients, we always start our days with something delicious. Here are 4 of our favorite gluten-free breakfasts, from our family to yours. cup of gluten-free oats to a mason jar with: 1 tablespoon of chia seeds, a small handful of frozen blueberries, a dash of cinnamon and a drizzle of honey, and ⅔ cup of milk. Cover the jar and rest easy: Breakfast is already made. 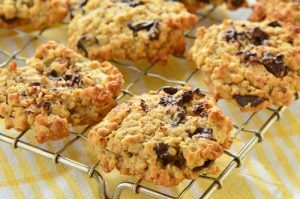 You can make these drool-worthy cookies on the weekend and eat them throughout the entire week. Simply mash 2 ripe bananas in a mixing bowl and add a handful of dried cranberries with 1 cup of gluten-free quick oats. Adding a dash of cinnamon (or even some chocolate chips!) is optional, but highly encouraged. Bake these cookies at 375°F for 10–12 minutes. You can actually make these in a matter of minutes. In a large mixing bowl, mix together 2 ½ cups of gluten-free oats with 1 cup of sunflower butter (this way, they can double as a school-safe snack). Add in ¼ cup of pure maple syrup, 2 teaspoons of cinnamon, and ½ cup of chocolate chips. Coat your hands with some butter so the balls don’t stick while you’re forming them in your hands. And…that’s it! Store in the fridge. Who doesn’t love banana oatmeal pancakes? They’re simple, delicious, and packed with heart-healthy nutrients. Simply mash together 2 large eggs with 1 cup of gluten-free oats, 2 ripe bananas, 1 teaspoon of baking powder, and ½ cup of milk. You can also toss in some cinnamon, chocolate chips, or even coconut flakes. Cook as you would any other pancake and top with fresh fruit for an extra boost of nutrients. Gluten-free breakfasts don’t have to be bland and boring. If you’re looking for some more amazing recipe ideas for the whole family, head over to our Recipes section.